On Sunday five members of Thanet’s recently founded boccia team, Thanet Thunderers -led by Boccia England officials Terry Fearn and Jackie Potts – took part in its first open tournament. The event was held at the Medway Park Sports Centre in Gillingham, where the facilities were used as a training camp for the 2012 Paralympics and are fully accessible and equipped for disability sports of all kinds including boccia, wheelchair basketball, and athletics. 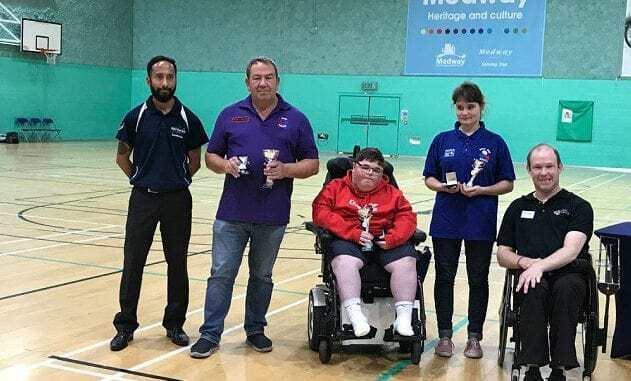 The Kent and Medway Boccia Singles Championship was presided over by head referee Jan Mulligan who welcomed the Thanet team to the Kent League alongside players from Dartford Boccia Club, Herne Bay Herons, Prince Arthur Boccia Knights from Gillingham, and Bexley Dodgers. At this pan-disability singles event Thanet Thunderers were up against some stiff opposition from veterans of the game, including some National League champions, but two players, Philip Coles and Terry Bailes, reached the quarter-finals, and Jacqueline Aves won two pool matches, only narrowly missing out on a place. The final was presided over by Dan Bentley, a Boccia England referee and Paralympic Gold medallist. Terry Bailes fought a very closely contested match in the final against triple Kent champion and Boccia England player Josh Wilkins from Sidcup, and came home with a well-deserved silver medal. This weekend Thanet Thunderers are off to play in Chimay, Ramsgate’s twin town in Belgium, where they hope to play teams from Chimay and Conflans-Saint-Honorine. If you would like to join the team just contact Thanet Thunderers on their Facebook page.or call Terry or Jackie on 07505 120059 for more information.